Pharmaceuticals are so last century. It’s all about getting back to our roots, these days: No more synthesized drugs. No more processed foods. No more gluten, er something. You got a pain, you don’t take lab-concocted analgesics — you smoke a joint like our great-great granddaddies used to do. 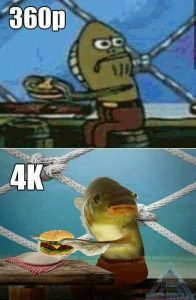 It’s hip and it’s fun and it’s cool. Which is why I’m confused NootropX went the pharmacy route with its design: no one trusts pharmX products anymore. They should’ve done what Alpha BRAIN is doing with its “Earth Grown” formula, a supplement that appeals to both the hippies and the Joe Rogenesque meathead stoners. NootropX or Alpha BRAIN: Which is better? Most nootropic brain health supplements these days take two approaches in their image: the clean, pharmaceutical glaze of NootropX or the Earthy, all natural look of Alpha BRAIN. 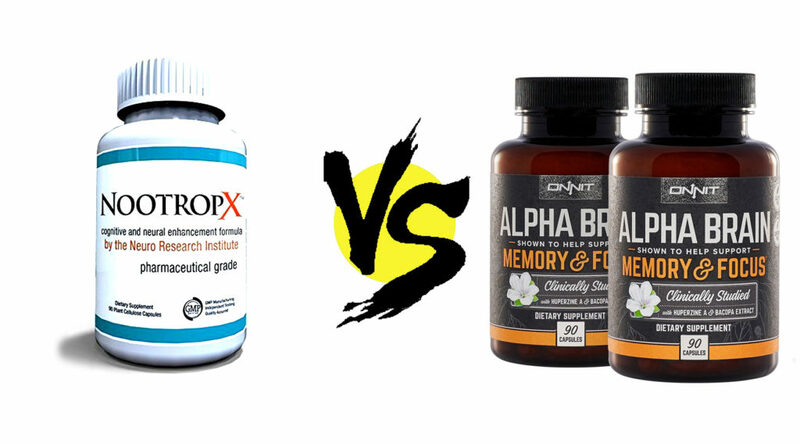 In both formulas, these design differences are most apparent in their additives: NootropX packs in more junky additives than Alpha BRAIN’s clean, green capsules. And this seems to have an effect on the pills’ general quality. NootropX is a disappointing supplement. And I can only be disappointed by NootropX if it managed to get my hopes up in the first place. However, it quickly loses its luster by the supplement’s all-encompassing proprietary blend, which masks all of NootropX’s ingredients beneath a single dosage: 1,465 mg — which isn’t the world’s worst dosage, but it isn’t great given the sneaky insertion of caffeine into this formula (presented as Guarana extract). The proprietary + caffeine combo is a RED flag in the nootropic biz, diminishing my trust in the formula’s actual nootropic power. Read my in-depth review on NootropX. Flow – promotes alpha brainwaves for creative, flow-like thinking. Focus – enhances cholinergic brainpower via three pathways. Fuel – increases cerebral circulation and antioxidant capacity. Plus, there’s the patented ac-11® extract of Cat’s Claw, an Onnit special and a significant antioxidant, anti-inflammatory herb. Granted, Alpha BRAIN’s price per serving is much, much higher than NootropX’s, however if you try the Alpha BRAIN Instant formulation, you’ll get much more bang for your buck. Read my in-depth review on Alpha BRAIN. Korean Ginseng Extract – Need energy? Try ginseng. Need to relax? Try ginseng. The herb does both, enhancing physical performance and potentially cognition as well. Guarana Extract (Caffeine) – NootropX caffeinates its stack with a 50% standardized extract of guarana, a potent natural source of caffeine. Rhodiola Rosea Extract – A great adaptogen and a personal nootropic favorite, rhodiola bolsters brain and body against stress and fatigue. Alpha Lipoic Acid – Known as the “Universal Antioxidant,” ALA enhances the antioxidant capacity of NootropX against free radical damage. ac-11® Cat’s Claw Extract – Used only by Onnit supplements, this trademarked extract of Cat’s Claw provides a unique antioxidant edge to Alpha BRAIN. L-Tyrosine – When the brain is stressed, natural tyrosine reserves are burned. Supplementing the amino during stressful conditions boosts mood and focus. Oat Straw Extract – Quality extract of oat straw, which, similar to L-theanine, promotes alpha brainwaves for relaxed, creative, free-flow thinking. Alpha-GPC – NootropX uses choline, an ineffective brain ingredient, while Alpha BRAIN smartly chooses alpha-GPC, a cholinergic nootropic that can pass the blood-brain barrier. Pterostilbene – Carries antioxidant effects similar to resveratrol, except pterostilbene is 4x more bioavailable than resveratrol. These three herbal nootropics are great in their standard forms but way, way better when presented as standardized extracts. Ditto for the Alpha BRAIN herbs, which are also delivered in their extract forms — however, if these extracts are standardized to any particular percentage, I don’t know: Alpha BRAIN doesn’t tell us. What Alpha BRAIN does do, however, that gives it an edge over NootropX is it uses the correct nootropic of choline: Alpha GPC, whereas NootropX uses the much inferior choline bitartrate form. Given the cholinergic emphasis in both supplements, this is a big deal: a workable choline supplement makes the other cholinergic ingredients (e.g., bacopa, hup-A) theoretically more effective at enhancing cognition. What’s more, Alpha BRAIN also stacks its formula in clean, easy-to-digest capsules, furthering the general quality of its supplement over NootropX’s Mg stearate-coated junk-caps. NootropX has the caffeinated adaptogens. Not everyone’s big on caffeine in their nootropic supplements, however NootropX at least makes up for this by stacking its caffeine with L-theanine. Also, the supplement stacks a few more anti-stress adaptogens in its formula, potentially smoothing out the caffeine experience even more — although, I’d like to know the exact dosages of each ingredient before fully lending credence to NootropX’s design. Alpha BRAIN packs cleaner, fresher cognitive enhancers. Alpha BRAIN leaves out the caffeine to make more room for the actual cognitive enhancing nootropics. And the nootropics it chooses are not only more effective than NootropX’s but they’re healthier, listing through some of the best, most potent antioxidants, anti-inflammatories on the nootropic market. Granted, not everyone’s down for the more subtle approach that Alpha BRAIN takes in boosting brainpower, but it’s an effective design (that’s even more effect in the liquid mix Alpha BRAIN Instant formulation). Here’s the thing: NootropX is pretty damn cheap. Alpha BRAIN is pretty damn expensive. This may be what ultimately sways your decision. (The expensive 15-day supply of Alpha BRAIN is actually one of my biggest beefs with the product.) However, for the sake of these comparison reviews, I tend to leave price out of my ultimate judgment — unless the price per value ratio is especially bad (or good) for a supplement.